Well, it was a long day, but it turned out well. 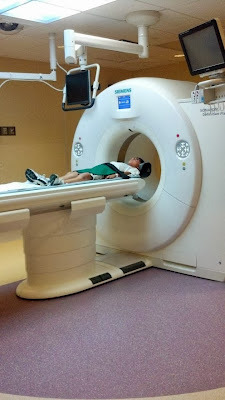 Early in the morning, Azer got the CT scan off his sinuses to check for nasal polyps. The machine he used was brand-new, so he was the very first person to try it out! The CT scan revealed there are no visible polyps, and just typical CF mucus thickening. So, that's a relief! He managed to gain 3 lbs in a month. The Tobi isn't supposed to make you hungrier, but oddly he has had a bit more of an appetite lately. His FEV1 was 92%, which is around his normal baseline. His lungs sounded clear, and overall, the doctor was quite pleased. We haven't received the results of his culture yet, but the doctor said that the colonies of pseudomonas aren't resistant to antibiotics, so there is hope for possible eradication of it. I wanted to share a little information I was reading recently on another CF mom's page. 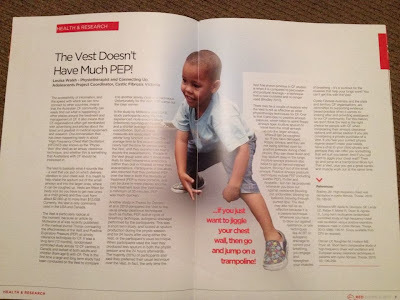 This article in the CFWA RED Magazine, summer edition, lists several studies done and have found the Vest to be much less effective than Positive Airway clearance methods. Here is a segment of the article. There may be a couple of reasons why the Vest is not as effective as other physiotherapy techniques for CF. One is that it provides no positive airways pressure, which helps to splint floppy airways open to allow sputum to travel from the small airways up into the larger airways, where it can be coughed up. If you have damaged, floppy airways, and they are not being splinted open by positive pressure during chest physio, they can close down and trap sputum deep in the lungs. Positive airways Pressure also helps to get air behind trapped sputum, forcing it out of the small airways. Positive Airways Pressure techniques include PEP (including Bubble PEP), Flutter, and Acapella - but can be produced whenever you blow out against resistance (blowing out under water, blowing up balloons, blowing through pursed lips). The Vest may also not be as effective because it is a passive technique. Whenever you have to blow out against resistance, or use techniques like ACBT or autogenic drainage to control your breathing, you engage and strengthen your muscles of breathing - it's a workout for the muscles that help your lungs work! you can't get this with the Vest." I have always felt that the Vest hasn't been as effective for Azer has Chest Percussion Therapy. While I am not considering eliminating the Vest from our treatments, I will be throwing in more CPT sessions along with using the Acapella. After a few days of using the Acapella in addition to his normal breathing treatment routine, I have heard a difference in his cough, and he says his lungs feel clearer. Just another weapon in the arsenal!